"Humein tou bataya gya tha k yei naach balyei ka competition hai"
#PSLT20 main Lahore ki wohi auqat hai jo "Dhobi ke Kutty " ki hoti hai ???????????? Lahore wale itna Metro Bus ki waja say zaleel nahin hue thy. Jitna ye Qalandars nay kar diya hai. Ravi Bopara has destroyed Lahore Qalandar. Bopara destroyed #Lahore more than Shareef Brothers. ???? #ZalmisVsUnited is underway at Sharjah Cricket Stadium! Tune in now! Living in Isb but heart beats with Pesh. Sharjeel Khan and Shane Watson. One more good partnership again please!!. 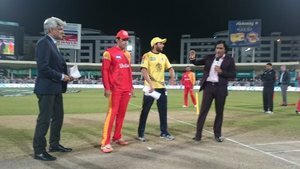 #Zalmi won the toss and elected to bowl first. Aur jo hara wo Lahore Qalandar.